June 4, 2013 Adri H.
Inside, though, there are three of my designs! I can finally reveal them since they're officially out in the open. These three designs mark my first official printed-in-a-magazine knitwear designs. I'm super excited about them! Firstly, there's the Rosita Hat & Mittens set. The Rosita Hat & Mittens were inspired by the beautiful embroidered motifs on the traditional dresses of the Yucatan. The mittens are knit in the round from the cuff to the fingers using stranded colorwork. 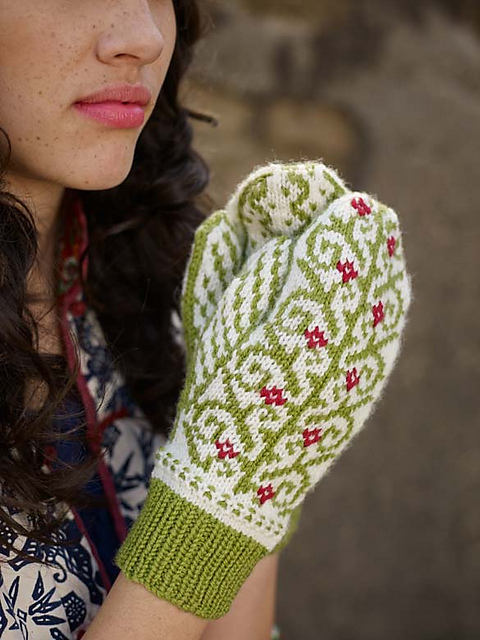 Duplicate stitch is used to embellish the main mitten with flowers to finish the look! The hat is made in a simpler way and uses a nice dots and dashes pattern to provide a bit of contrasting color. The brim also looks nice folded up. The third design in this issue of Knitscene Accessories is the Bow Slouch. This is an easy pattern with a twist. The brim is actually folded up and doubled for a nice, snug fit. It can stay on even when worn at the jauntiest of angles! This yarn, Accordion, is awesome. It's so soft and knits up beautifully. I never thought I'd be a fan of a mohair blend, but here it is folks. I loved it. And even made up a second hat for my mom. Hers has a more modest bow, though. I only wish I had more of this yarn to make up a third sample for myself! And there you have it! One of my big secrets I've had to keep under wraps since last year!